Learn how to be a contributing member of the Slickdeals community! Slickdeals was built on the philosophy of sharing deals, shopping tips, and price mistakes. And what sets Slickdeals apart from other sites is the quality and quantity of deals surfaced around-the-clock by our enthusiastic community of seasoned and aspiring deal-hunters (that's you!). To better help the deal-train chug along, we've updated the way in which you share a deal, making it easier than ever before. 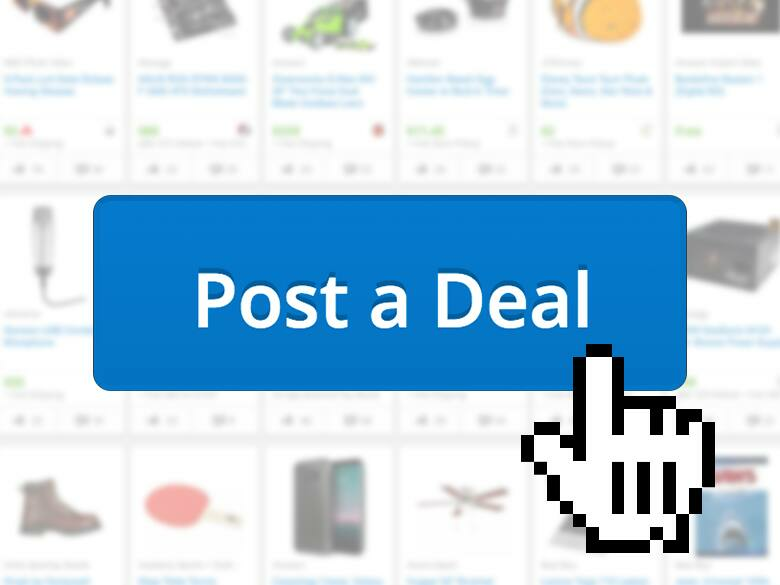 This beginner's guide will walk you through the process of creating a new deal thread in the "Hot Deals" forum using our new-and-improved "Post a Deal" submission form. Make sure you're signed in to your account — posting is reserved for registered users only. If you don't have an account, sign up for one HERE. It's free and easy! With 10 million monthly users, there's a high probability that someone has already posted the deal you're looking to share. It's always a good idea to do a quick check in an effort to not clutter up the forums. 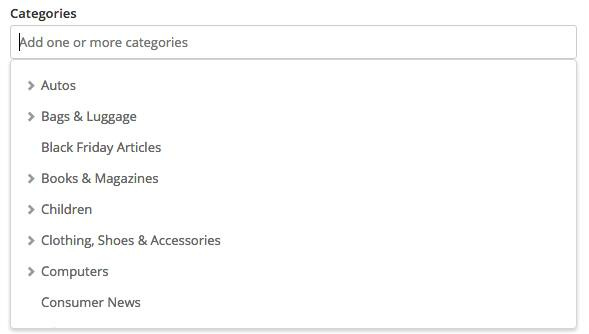 Use the search bar at the top of the homepage to quickly reveal any recently posted or active deals that may be a duplicate to yours. The site mods will thank you for not adding to their workload! The ability to share deals is what makes Slickdeals so powerful, and we've created a streamlined form to help you quickly communicate details regarding your money-saving discovery. 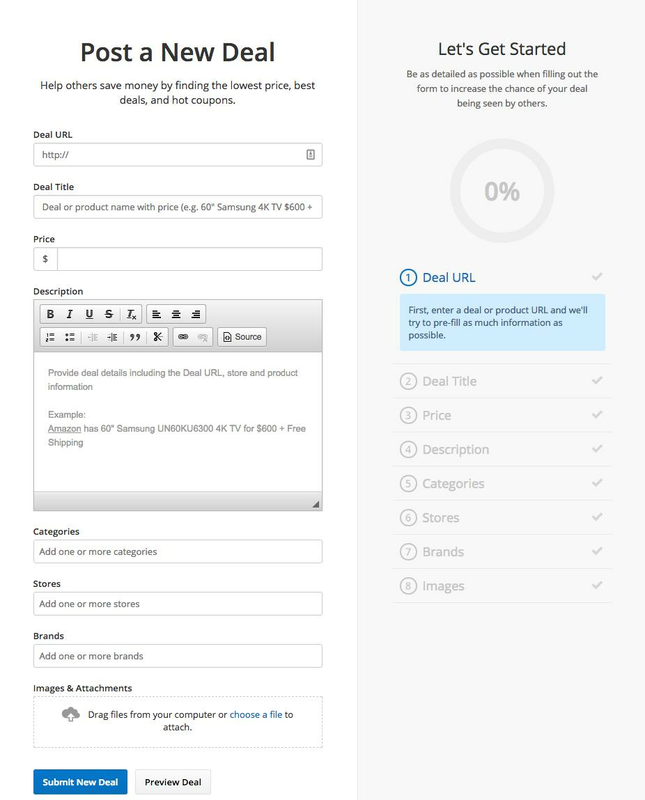 To find this form, mouse over "Deals" in the main navigation bar on the homepage, then click on "Post a Deal." Copy/paste the direct link to the specific deal or product you're trying to share. 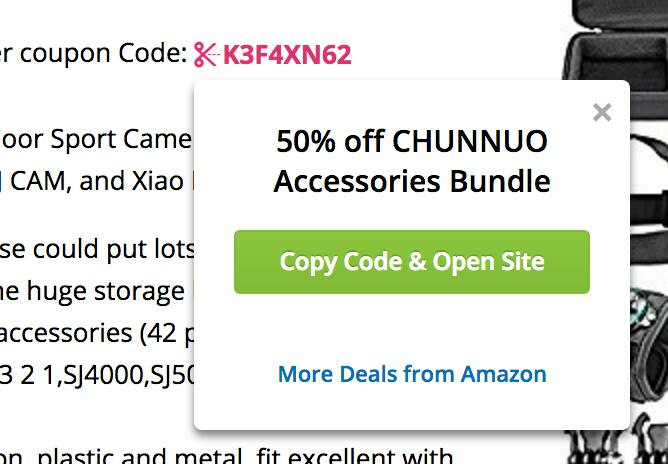 If it's a site-wide promotion, linking to the main store page is fine; same for if it's an in-store deal only. The form will do its best to pre-populate as much information as it can from the link, and also automatically place the link in the description box (more on that later). This is where some people start to get intimidated. "What information do I include here?" "Do I need to explain why it's a good deal?" You know what? Don't overthink it. Just put down the basic information that someone would need to get a clear idea of what you're sharing. At a minimum, you should include the final price (or discount amount), the store's name, as well as brand and model, if applicable. To further enhance the title, you could mention additional details that might affect someone's purchasing decision, like "price after rebate" or "free shipping after $25" or "w/ coupon code." And do you know where you can find some great example titles to copy? Our own front page! Pretty self-explanatory. Put the final purchase price of your deal after all rebates/coupons/promos. This big open box is usually where people abandon their deal sharing efforts for fear of not writing the correct things, or not knowing what to say. My trick for handling this unwieldy description box is to copy/paste the title in here as a starting point. If you did a good job of covering the basics in the title, there's really not much else to add. The description box is mainly used to elaborate or add details on how to obtain the deal/price you're sharing. Do you need to create a new account somewhere? Are there steps you need to follow, like clipping coupons? This is where you'll offer tips to help people reproduce your deal, but if it's a straight-forward discount, it's totally fine to just leave the deal URL there by itself (which was automatically pre-populated for you). If for some reason the deal URL does not appear in the description box, please be sure to add it — step one of reproducing the deal is getting to the product page! You don't need to justify why it's a good deal, or how you found it, or why anyone should buy the product. If you made cookies for your friends, do you also pitch them on how good they are? No! They can eat the cookies or not. Doesn't make a difference to you, right? Now, if you're sharing a site-wide deal, you may want to consider using this space to highlight a few really good deals so people can get an idea of what to hunt for. Again, it's not necessary, but the more information you can provide to help someone's purchasing decision, the more likely they are to give you a thumbs up, which is what will drive your deal thread into the Popular category and potentially the front page. All deals will need to be filed under a category, so click on the blank field and use the drop-down menu to choose an appropriate product category. You can choose multiple categories — for example, a laptop is a type of computer, so you can select "Computers" as well as "Laptops"
In order for your deal to appear on one of our many store pages, you'll first need to tell us which store this deal is available from. Start typing the store name in the empty field and a drop-down will appear with matching results. Click on the store name you wish to list your deal under. The store must be an exact match, so if you can't find an appropriate store name, simply leave this field blank. Include a brand name to aid deal-seekers with their browsing or search efforts. Start typing the brand name of the product you're submitting and a drop-down will appear with matching results. Just like the store name, the brand name must be an exact match for it to be included. It's OK to leave this field blank if you can't find the appropriate brand. 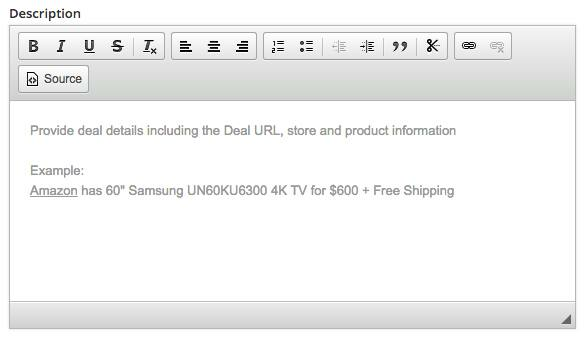 Upload images of the product you're referencing or choose one or more from the list of suggested images that were automatically pulled from your deal URL — just click the little "+" icon next to a suggested image. Step Ten — Submit Your Deal! If you'd like to make any changes in the deal submission form, feel free to jump to any step mentioned above and make edits. You can also see what your deal thread will look like by clicking "Preview Deal." Once you're happy with everything, click the "Submit New Deal" button! For deals that require a coupon or promo code, you can make things super easy for everyone by creating a "clippable" code in your deal description. 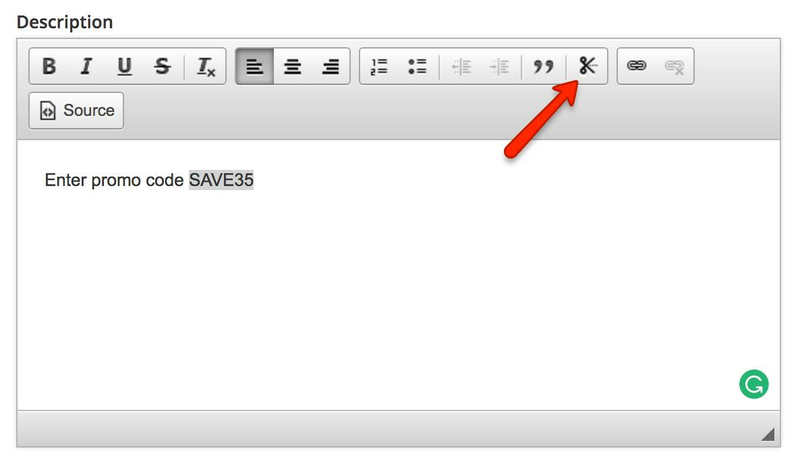 Start by highlighting the promo code in the description box, then click on the "scissors" icon in the tool bar. 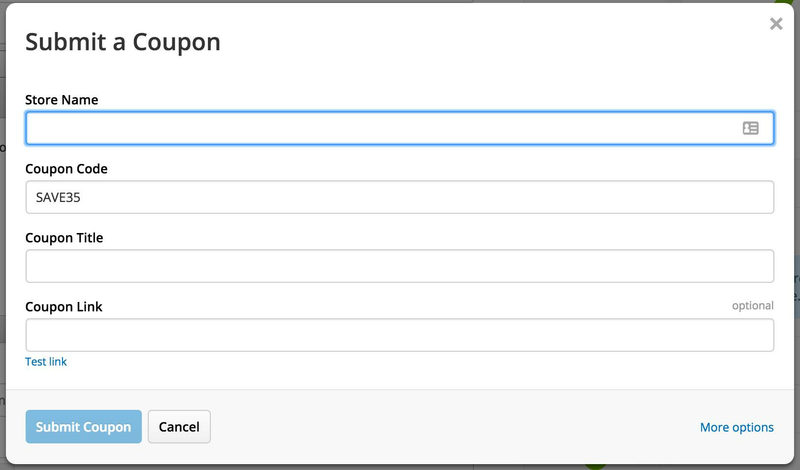 A pop-up form will appear, asking you to choose a Store Name (exact match only), Coupon Title (use a basic description), and Coupon Link (same as the deal URL).